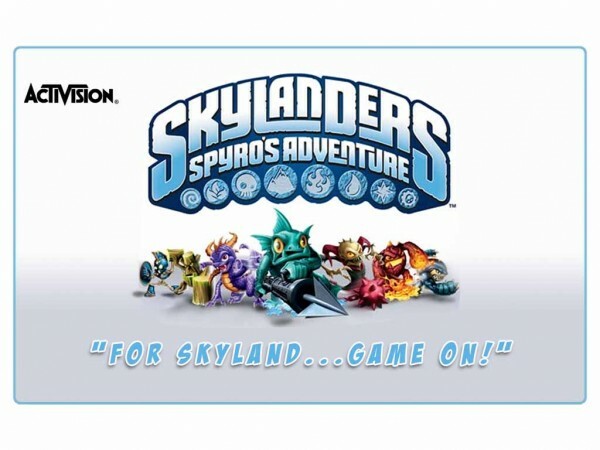 Alien Cyborgs – Spyro+Pokemon+Hero Clicks=SKYLANDERS!!! So this Christmas I was walking with my 10 year old son through the local Best Buy doing some last minute shopping when a shiny new display caught my boys eye…He ran up to it and like a scene from a movie where man first discovers fire. My boy “sniffed” around the Skylanders display, looking at all of the brightly colored characters in their packages. He picked up a blindfolded elf holding a bow and arrow. His eyebrow raised in interest. He quickly flipped over the package to read what this guy’s story was all about. He looked up at the television display showing clips of the game. He quickly looked at the illuminated “Portal of Power”, he looked at the character in his hand and he slowly placed it on top of the glowing Power pad. The screen came alive with the dancing blindfolded Elf, FLAMESLINGER. All of a sudden it clicked! Before he even knew what it was, he was hooked! My son had been bugging me literally for years for an iPod Touch and now that he was finally in the double digits in age, I was ok with getting him one. He knew this. It was practically under the tree…my boy runs over to me and yanks on my arm, “Dad, forget the iPod touch, I WANT THIS!! !” And just like ‘Golem’ he picked up the Skylander’s Starter pack and started to caress the box…”My Precious” …lol, Gotta’ love my kids sometimes! So after some looking over the display myself I told my son to forget about it and got him the iPod Touch anyway! I mean “c’mon,” I thought, “This is just some new fad that would die out like the “pog” of my generation.” But as Christmas came and went, one fat Christmas gift card was all my boy needed and by Dec 26th, he Had his copy of Skylandersfor the Nintendo 3DS. A Starter Pack includes the “Portal of Power” a cool base that allows you to upload and save your characters game progress, 3 game figures, and a copy of the game. You get posters and art crap too but that stuff just ends up in my pile of paperwork. Anywho, ever since Christmas all I hear about and all his allowance goes to is Skylanders! Now my boy is a little mini-techy and so it’s not surprising that he was an early adopter of the game, but even more impressive is that his friends are just as hooked and committed as he is! Could this be replacing the Pokemon as the boys “trading card” of this generation? I think it just might be! Keep reading to find out why! 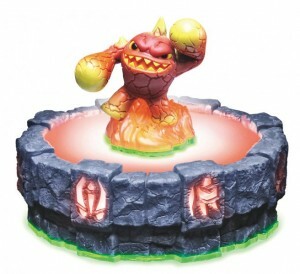 The Story goes: The Skylanders have used their magical powers and weaponry to protect the Skylands from evil forces. However, a malicious tyrant has risen up to take down the Skylanders. He has frozen them and banished them to Earth. You play as a Portal Master! Only you have the ability to place the Skylanders on the “Portal of Power” and bring them back to life to save Skylands forever! Portal Masters control the “pathway” between Earth and Skylands. 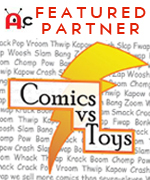 30 different characters, in badass 2 inch figurines, including Spyro the dragon, and characters like Eruptor, A Fire Tossing Golem, or Stump Smash, an ‘Ent’ who bashes foes with large trunk stump hands! One of the coolest aspects of the games IS most definitely these little figurines. 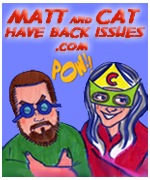 One, they are pretty well made and awesome to look at, so you would want to collect them. One of my personal favorites is “Boomer” a dynamite toting elf! The Skylanders are bigger then hero clicks, so you really get a lot of cool detail. They characters are all elemental based of some sort. There is water, fire, magic, undead, life, tech, & air. 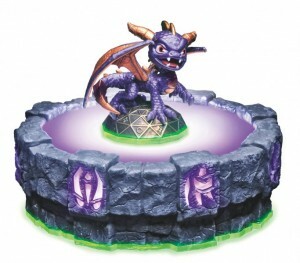 Each Skylander is weak against one certain element: Earth is weak against Air, Life is weak against Undead, Fire is weak against Water, and Magic is weak against Tech. As you progress through the game your character gains level, like in most RPG’s, but your figurine saves your characters progress locally. 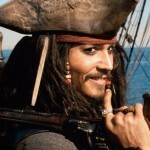 Which brings me to two: they are tradable! So, let’s say your friend has a character you’ve been wanting to try, and you’ve got one he’s been wanting to play, you can swap them or trade and play your friends character and vise versa! It doesn’t matter if you have the PS3 version or the Nintendo DS Version or the Xbox, they are all standard and work on all platforms! 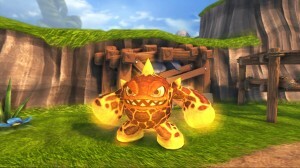 You can have two characters loaded into the game at a given time and you can swap different characters out any time using the “Portal of Power.” You can also Put two Skylanders on the Portal of Power and battle with your friend as a team. Or pick a Battle Arena and go head-to-head. Once you have a collection of leveled up characters you can show the off online. You can also get an adventure Pack which is an additional Skylanders Character, an adventure piece( a boat,castle, etc. ), and 2 magical items to help you expand your adventures! Given the amount of characters and the unlimited amount of levels that Activision could release via DLC and Adventure Packs, this could be the game to knock-out the long running Pokemon Champion in regards to RPGs AND physical “Trading” card type games! 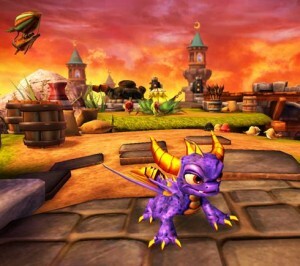 Skylanders has cool graphics. Dyanamic and fun characters and a catchy niche in the figures and physical “Portal of Power” that I say yes! That backed with son, video game phenom that he is, rarely picks a bad game, and when he does its out faster than vegetables when they hit his lips. I would strongly advise Pikachu to watch his back, Spyro is coming!